From the filmmakers behind Finding Nemo, Monsters, Inc. and Cars comes Toy Story 2 – the highly acclaimed hit that earned a Golden Globe® Award for Best Picture. Rediscover the humor, heart and friendship of this hilarious adventure in a spectacular new Special Edition that goes to infinity and beyond! Enter Disney/Pixar's incredible world with Woody, Buzz, Jessie and Bullseye in the movie that shows us what being a toy, and a friend, is all about. 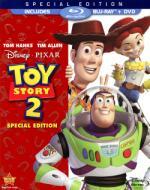 Plus, get a look at how the incredible tale continues with an exclusive sneak peek at Toy Story 3. This must-have comedy classic is the perfect addition to your Disney/Pixar collection, and now on Blu-ray™ featuring Disney enhanced high definition picture and sound, it's hours of fun for the entire family! First of all, this movie looks amazing on Blu-ray. Well worth the upgrade. I don't know for sure, but I'm thinking this one picks up about 6 months after the end of the first movie. That one ended on Christmas with the toys anxiously waiting to find out what new toys might show up and learn there is a puppy in the house. With this movie, Andy is getting ready to go to camp and the dog isn't a puppy. The plot for this one can stand alone, though it does build on what had been established in the first movie. The plot is very interesting and it adds new things to Woody by sharing what sort of history he has as being a character in a show with Jessie, Bullet, and Stinky Pete. The idea of Woody being worried about his fate after he is damaged makes sense with what has been set up in the first movie with the toys and their concerns. Jessie's story is absolutely heartbreaking and the song fits it perfectly. This is the first Pixar movie that made me cry. It wasn't that last. I like the addition of the toy collector and see him as a villain. Having Buzz and some of the other toys go on a rescue mission for Woody makes sense too, especially after what Woody went through to help Buzz previously. It is so funny when they are trying to cross the street. The animation is wonderful and an improvement over the first movie. It is really amazing what Pixar was able to achieve in just a few years. Humans still don't look exactly right, but they are better. What really stands out is the settings outside. The grass and trees and everything just looks so much better. I noticed details that I hadn't before, like the grain in the wood on furniture and the texture on the toys themselves. It all looks amazing. Jessie is a good addition to the cast. I really like Bullseye and think he looks so cute most of the time. Stinky Pete is another good new character even though he doesn't get as much to do overall. The returning toy characters are pretty much like they were in the first movie. Woody does get some new doubts to deal with. Mrs. Potato Head does get a bit shrill at times, but it isn't too annoying. I enjoyed it when Buzz encountered all the other Buzz Lightyears in the toy store...and how the other toys had to deal with a new delusion Buzz. The extras on the Blu-ray are wonderful and interesting. The tribute to Joe Ranft is really very nice. I had no clue he had worked on so many Disney movies before going to Pixar. I posted a review on Epinions a few years ago.